My Internet Explorer is packed with so many of these toolbars. How do I get rid of them? Thimphu. I'm talking about your screen, which is a precious and limited resource. Think of it as expensive real-estate. It should be used for viewing web content, not useless toolbars! These toolbars often creep into your browser when you download and install free software from dubious sources. Fortunately, getting rid of these toolbars relatively easily. 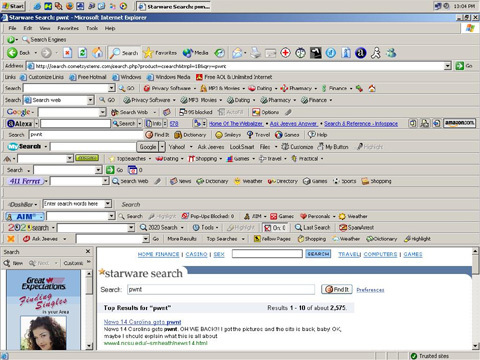 In addition to getting more real estate for your web content, getting rid of these toolbars will also accelerate your computer, since toolbars slow it down. And your privacy will be better protected, as many of these toolbars track your actions and send that information to who-knows-where. Got a Google account? Check out the new Google Drive (drive.google.com), an online storage service that allows you to save your files in the "cloud". Uploading a file to the cloud is very easy: You just drop it into a directory on your computer. The first 5GB are free. Existing services such as Microsoft's SkyDrive (www.skydrive.com, 7GB) and the popular DropBox (www.dropbox.com, 2GB) offer similar features.